When we were in Seattle over Christmas, Trav's mom pulled out this darling quilted bib that her mother had made for one of her children. It was so cute I thought I'd try to re-create it. Mine is a little bit different, and by way of a disclaimer, I just made this up as I went along so if you happen to be someone who is a very accomplished seamstress, and you are asking yourself, "Why on earth did she do it that way when there is such a more sensible way to do it?" then I am sorry for wasting your time. 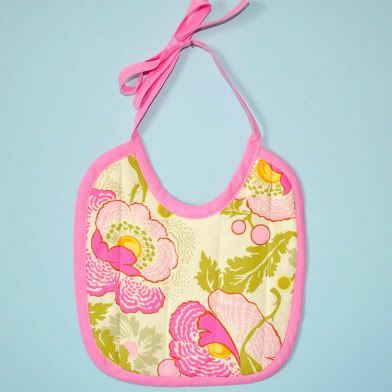 First, draw a bib-ish shape on some sort of paper. I used wax, but a paper bag, newspaper-- anything paper-- really will work. I folded it in half to make sure its symmetrical. This is first grade stuff here. 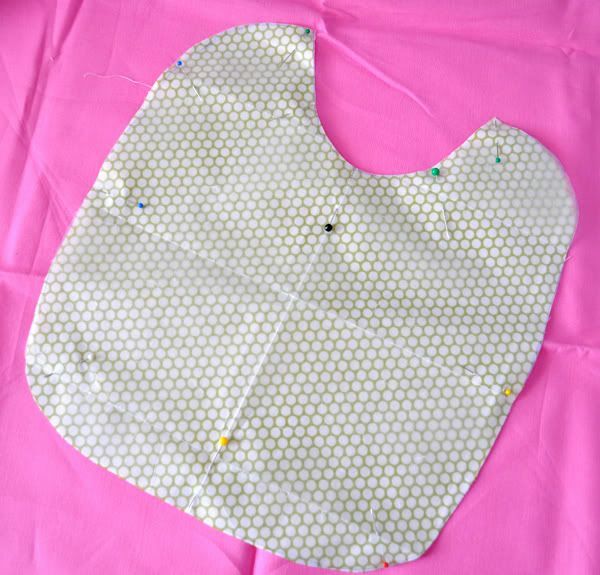 If you are not so great at visualizing the shape, you can trace a bib you might already have to get the general shape. 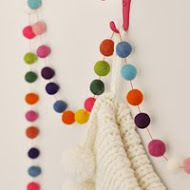 mine was about 10 inches long and about 9.5 inches wide and fits my 8-month-old perfectly. Moving on. 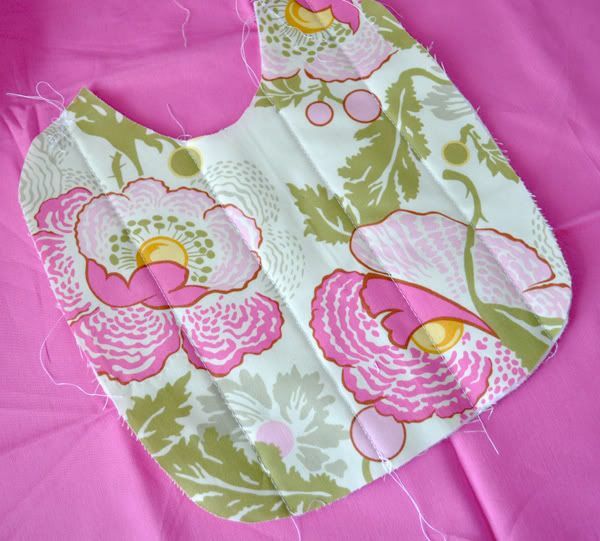 So cut out your pattern, and then pin it to your fabric and cut out. Pretty simple. Now you will repeat this for your other fabric as well as your batting. You could be crazy and do all three at once, but I wouldn't recommend it if the pattern in your fabric has any kind of design that needs to be centered. You don't want your stripes to be wonky. Unless you do. So now you make a little quilt sandwich: first fabric, batting, second fabric. That makes sense right? 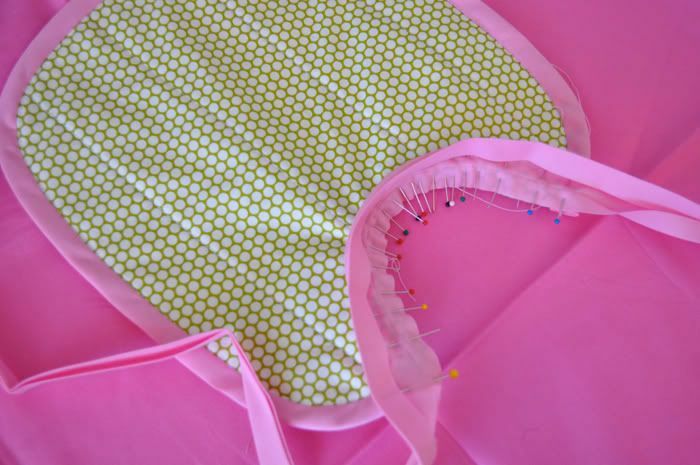 You want the right sides of both fabric facing out. Now pin it all together making sure both sides are smooth. Now, we quilt. Here you can do whatever you want. I just did four straight lines about 2 inches apart. 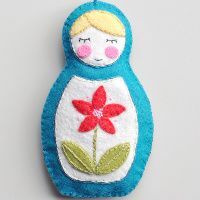 Because this is such a small project you can just do it right in your sewing machine...no special foot needed. Just make sure the whole project goes through together, so one layer doesn't bunch, but if you pin it well it should be fine. You can really play around with your quilting. Whatever design you see fit. Aren't you excited by how fast this is going? Almost done. 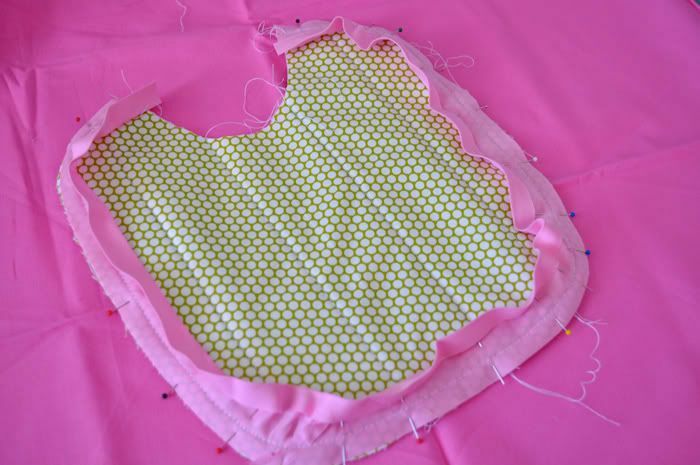 Now unfold your bias tape and pin it so that the raw edge of the bias tape is up against the raw edge of the bib, right sides together, along the outside of the bib only (we'll do the neck in a minute). 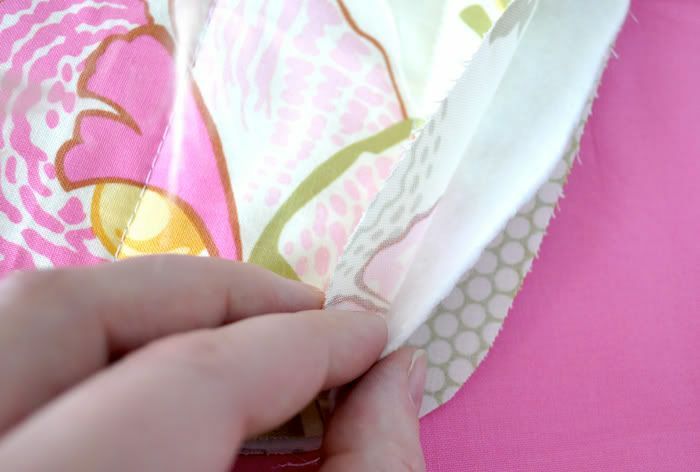 Sew in the crease (fold) of the bias tape (not the center one...the one closest to the raw edge). Now turn the bias tape over the raw edge and pin it down on the other side (leaving the raw edge of the bias tape folded under this time). The trick to having a smooth curve is using lots of pins. Sorry, there is just no way around it. Now edge stitch the bias tape as close to the edge as possible. Its looking good right? 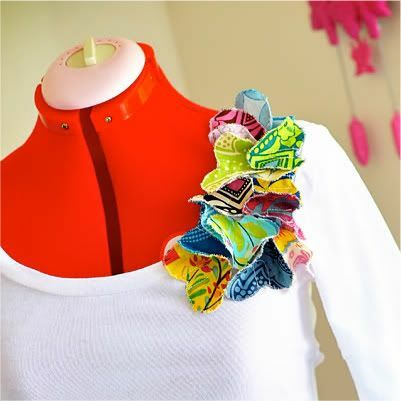 Now cut a piece of bias tape long enough to comfortably tie around your little cherubs sweet neck. I cut mine 38 inches, and it is plenty generous to tie a nice sweet bow. OK so fold it in half lengthwise and find the center. You can mark it or just eyeball it and remember. 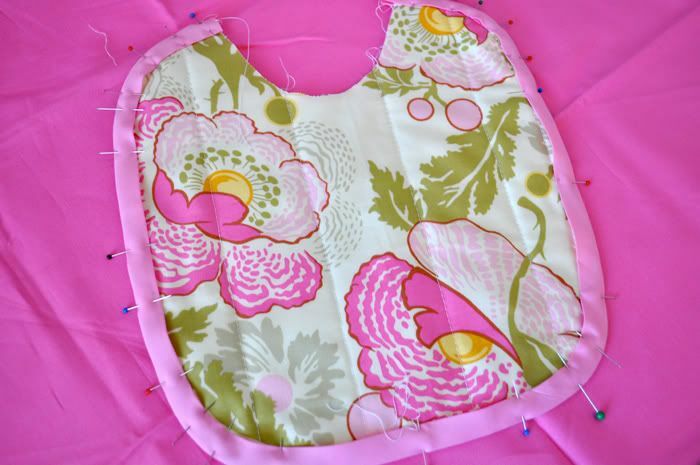 So open the tape just like in the last step and place the center on the center of the bib neck and repeat the pinning process. Sew the tape to the neck leaving the ties alone for now. 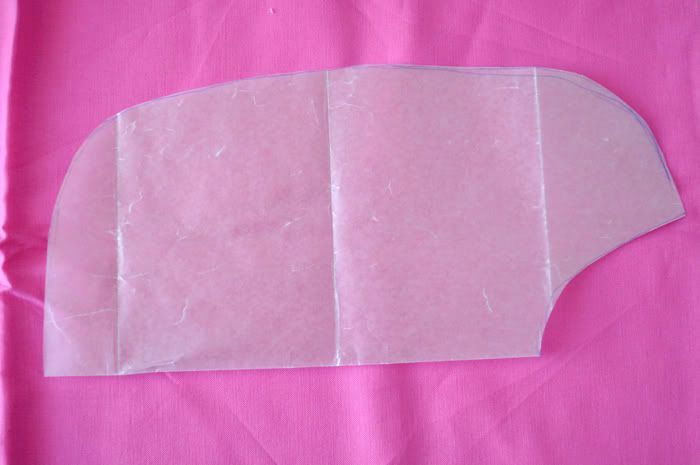 Now fold the tape over the raw edge like before and pin like before. Only this time, also pin the ties together as they are already folded. Starting at the end of one tie, edge stitch the tie shut sewing towards the neck. when you get to the neck, just keep sewing along the edge to secure the tape. When you get around the neck keep sewing up the other tie till you get to the end. And that's it! Done. With time left to vacuum. So fun! Thanks for posting this. This is a sewing project I could definitely learn on (though I can guarantee you I wouldn't have time to vacuum afterwards). Very cute. adorable! 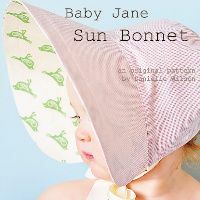 if only Juliet wasn't at the age where I only use waterproof bibs...I'll have to make some of these for the next baby. 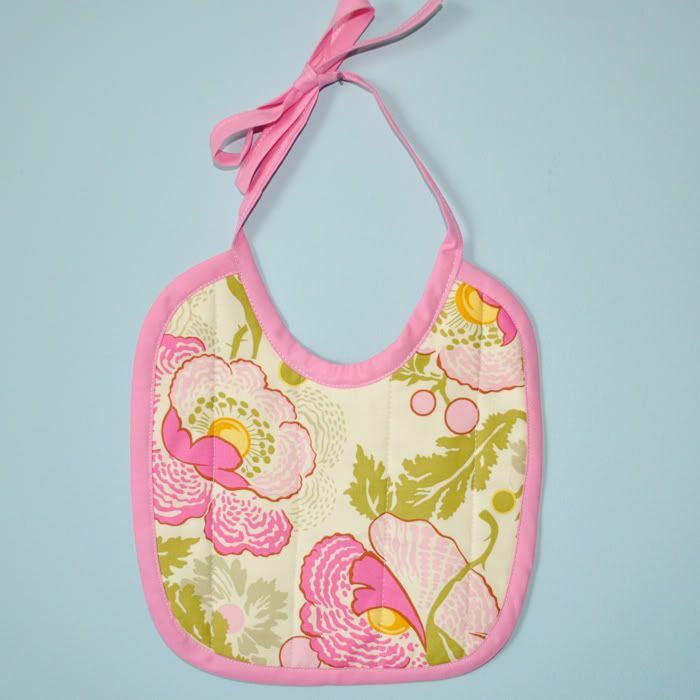 ps...I would really love to know more about the apron you made, because I have been searching high and low for a cute feminine apron pattern--the kind where I feel comfortable flitting between kitchen and guests. Well isn't that adorable! And it has your personality all over it! I love it! 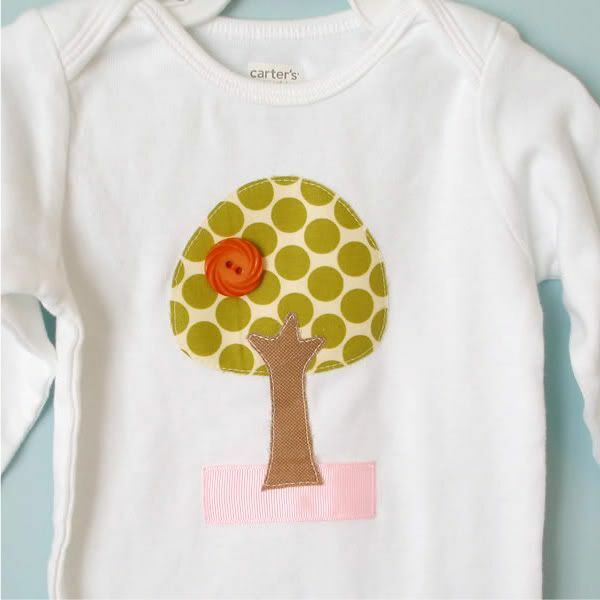 I need to get back into project mode and make some cute little things for boy #3. Something that's not a hand-me-down:) Why do I go in and out of project phases??? Do you do that? Sometimes I can't wait to get to the sewing machine, other times I dread it. 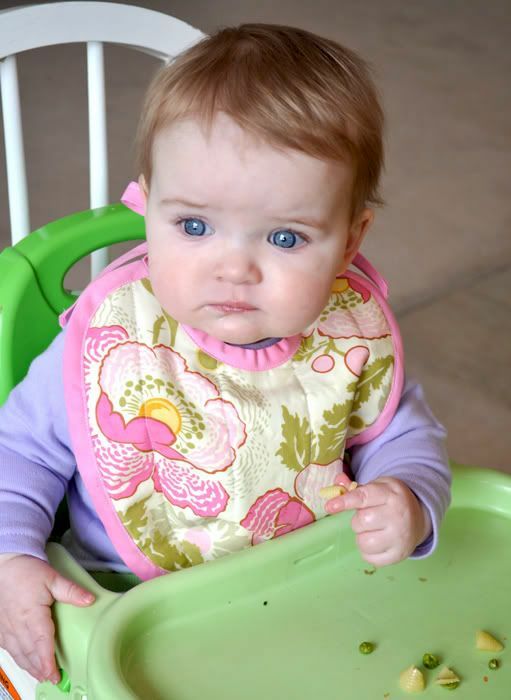 The bib looks so good on Avery! It is the perfect size. I was smiling at those little fingers picking up her food. The way she does that is just so darn cute! And I also wanted to add that I notice she is using her left hand again. Interesting. And while I am at it I'll just say I could use a good smoochy kiss on those cheeks! Thanks for sharing. 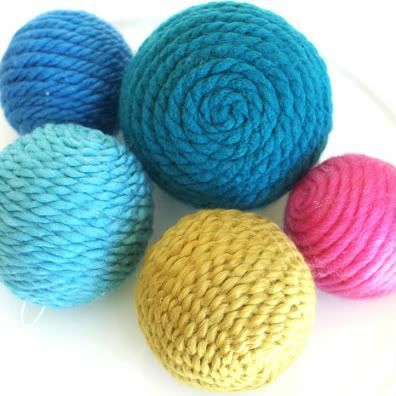 I love your ideas - I have made a few onesies that I figured out how to do with your tutorial and we have a bunch of fabric balls flying around the house at any given time! According to A Thomas Jefferson Education (which is what we are trying to implement in our homeschool) A “Mom School” describes some kind of group activity, lesson, or club that a mother creates for her own child, and then invites other families to join in. They can be designed to be whatever the mother who runs it needs them to be. So our mom school is basically a play group with a educational twist to it. I organized it so my kids could get some friends to play with on a regular basis! So cute! 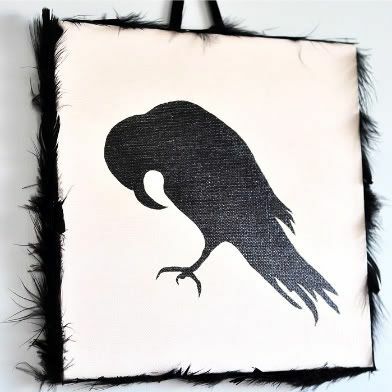 Sell some on Etsy! darling! Unfortunately that would take me at least 3 naps to complete.